Roughly bounded by Flower Street to the north, Earll Drive to the south, Randolph Road on the west, and 16th Street on the east. You may have driven past the distinctive homes of Cheery Lynn a hundred times without ever realizing they were there. If so, the next time you are heading north on 16th Street, take a left turn onto Cherry Lynn Road (just a few streets north of Thomas) and take a look. When Cherry Lynn Road ends at Randolph Road, turn right to tour Flower Street or left to travel Earll. 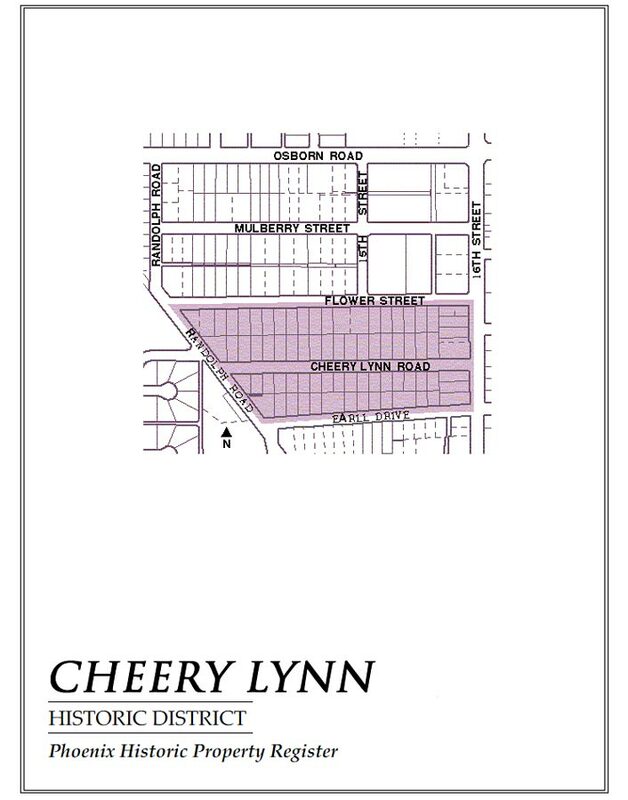 That’s the Cheery Lynn Historic District: a trio of three long, uninterrupted blocks of lovely homes behind grassy lawns. The manicured lawns of this “subdivision” may feel suburban, but that’s where the similarity ends. This was no cookie-cutter development. Each of these homes is one of a kind. Many are English Tudor or Cottage style, built in the 20s and 30s. A few magnificent Spanish and Mediterranean-style homes add a high note. Homes built later, post-WWII, are of a more modest French Provincial Ranch style. This blend of styles creates an interesting rhythm to the streetscapes of Cheery Lynn—with pitchy roofs next to red-tiled second stories next to low roof lines. The average home in the Cheery Lynn Historic District has 1350 square feet, but that average may be deceptive. The 40s ranch homes typically have around 1000 square feet with two bedrooms and 1 bath, while the grander, older homes are somewhere closer to 3000 square feet and have at least 3 bedrooms and 2 baths (and possibly a second story). Cheery Lynn was remote from downtown Phoenix when the first home was built in 1928. Today, it is a central Phoenix neighborhood by anyone’s measure, retaining its residential quality while enjoying retail along 16th Street. Maureen swears by the fresh pita bread from the Middle Eastern Bakery & Deli at 3052 N 16 Street.) More than 80 years have passed since this real estate was developed, yet Cheery Lynn retains the distinction it had when these homes were brand new and sold at a premium because they were walkable to the exclusive Phoenix Country Club just west. The Greater Cheery Lynn Historic District is proud to host its fourth Home and Garden Tour! We are welcoming you into eight of our historic homes on Sunday, March 19, 2017, from 10:00 AM to 3:00 PM. Homes on tour date back to the 1930's. Our tour also features music, local vendors, a food truck and fun for all. Tickets are $15 day of the event or $12 online (children under 12 are free)! Pick up your wrist band (tour pass) and tour guide at the ticket booth on the day of the event. 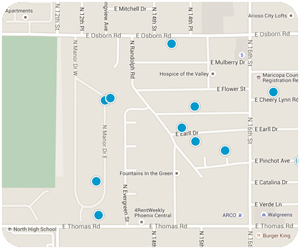 A map to help you find the ticket booth is here. *Tickets can be purchased online up to 10 pm March 18. Bring your receipt to the ticket booth to receive your bracelet.